The fireball is perhaps the most iconic move in fighting games. Along with the uppercut, it forms the basis of the genre’s most foundational strategies. As such, fighting games have evolved so that one or two characters in any given release usually have interesting ways to counter them. The PlayStation 4 game King of Fighters XIV received its first significant downloadable content bundle on April 5, and a returning fighter named Whip is making quite a splash thanks to the way she counters and reuses opponent projectiles. She’s showing off a new method for dealing with fireballs, attacks that fighting game fans have been facing since Ryu, Ken, and Sagat started chucking them in the original Street Fighter. The most common fireball counter is the reflect. Simply put, this allows a character to bounce the opponent’s projectile away, turning their own tools against them. Rose, who debuted in Street Fighter Alpha 2 before returning in Street Fighter IV, is able to both reflect and absorb fireballs, transforming them into valuable super meter. Street Fighter III’s Urien (now also playable in Street Fighter V) can emit moving plasma walls to deal with projectiles. Reflecting moves can even be found in Mortal Kombat and Super Smash Bros., but King of Fighters ’94 was one of the earliest games to popularize this mechanic thanks to the fireball-deflecting prowess of playable character Athena Asamiya and final boss Rugal Bernstein. Which brings us back to Whip. After first appearing in King of Fighters ’99, the appropriately named mercenary was playable in a number of subsequent releases before taking a break after King of Fighters XI. She was brought back in an expansion for King of Fighters XIV this week, along with Ryuji Yamazaki, Vanessa, and Rock Howard, turning heads thanks to the unique way in which she steals fireballs. Reflected projectiles in other games remain projectiles. They themselves can be reflected, dissipated, and generally treated as the same attack. Whip’s counter works differently. Instead of simply shooting a similar fireball back at the opponent, her reflection turns these attacks into a swirling ball that travels slowly across the screen without the usual projectile properties. 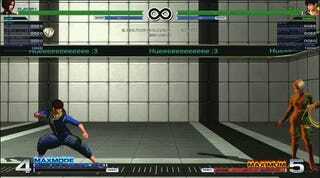 As the below clips from King of Fighters players Abril “El Rosa” Diaz Fernandez and Anthony “LordWalkman” Gerber show, this means it can’t be negated by additional projectiles. It can even reflect stronger projectile attacks, like supers. Fortunately, this isn’t the be-all-end-all counter it appears to be on the surface. It’s true that slow-moving projectiles provide great cover for approaching characters, but Whip’s reflect takes a long time to come out. It’s not something a competitor will likely be able to perform on reaction except from long distances (especially with some of the speedier projectiles present in King of Fighters XIV). Characters who rely on a strong zoning game will still need to keep it in the back of their minds when facing a smart Whip player. It’s also possible to bypass the orb with specific moves that are invulnerable to projectiles. As fighting games expand, developers rely on a small set of core ideas first etched in the early days of the genre. SNK has shown in their latest King of Fighters XIV update that it’s still possible to evolve those mechanics and churn out something new and exciting. Competitors now have a new challenge to overcome, and at the end of the day, that’s really what fighting games are all about. King of Fighters XIV competition continues this weekend at Northwest Majors IX in Des Moines, Washington, the latest stop on the newly organized Burst League tournament circuit. Despite releasing just a few days ago, Whip and her fellow downloadable characters are legal. Be afraid!